Ignite and learn to cultivate the leader that lies within. Discover your unique leadership style and approach, build and manage your personal brand and integrate wellbeing into your life consistently. Understanding others is one of the most important behaviors to hone. Managing and leading people and teams is an art. Hiring, communicating and motivating in the 21st century is a skill leaders must master. Broaden your network across industries, discuss best practices, and learn how to build high performing teams. 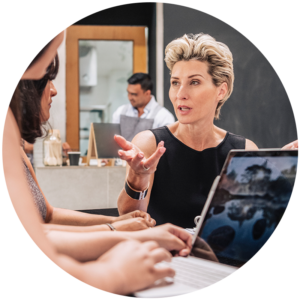 Catapult your leadership skills with emotional intelligence, exercise positive psychology and mindfulness, engage with like-minded women, and learn how to become an ON Point leader. Let us customize a professional development experience to help you achieve the goals you’ve established for your conference, annual meeting, or professional development event. Women ON Point leadership summits offer a premier professional development opportunity designed exclusively for professional women by top executive coaches. The biggest difference between an amateur and a professional is coaching; our top executive coaches will help you reach your goals and take you to the next level. Join the fastest-growing, leadership development experience for executive women committed to taking their leadership skills to the Next Level. You’ll be the first to know about latest events and initiatives from the Women ON Point.